I’m officially obsessed with maxi dresses and I look forward to receiving my wallpaper floral maxi from the regular LOFT store this Friday (see it on Jen of Skirt The Rules here). I quickly tried it on last weekend so I would know which size to order. Coincidentally LOFT had 40% off dresses earlier this week so I ordered it and a few other dresses to try. See my picks here and here. 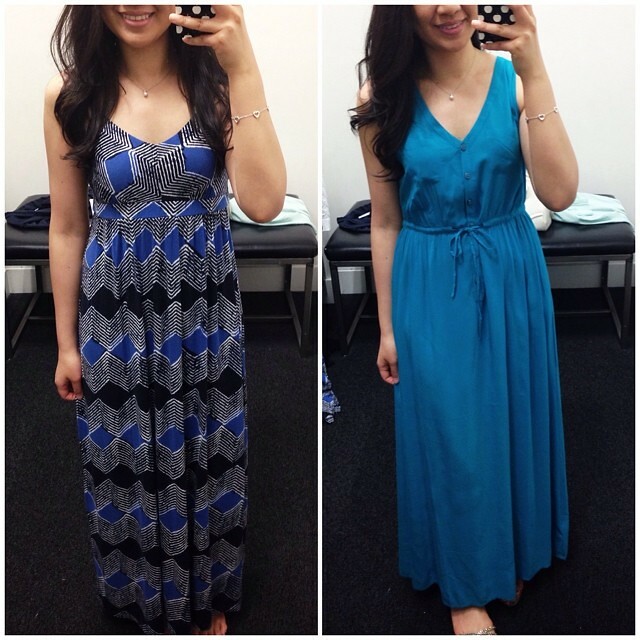 I also bought the two maxis pictured below from LOFT outlet. additional 15% off purchases of $75. 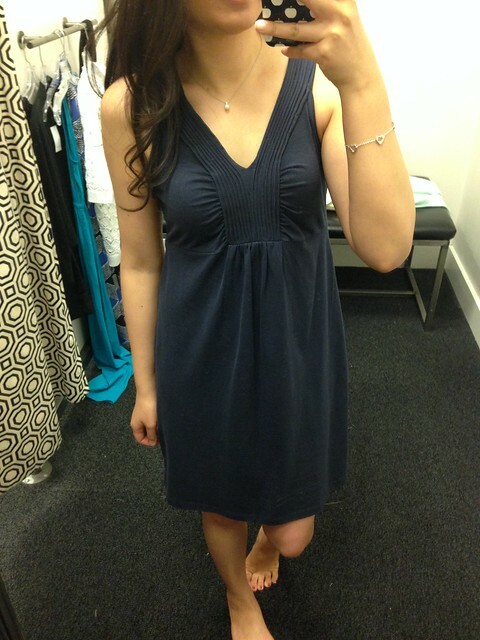 This navy dress also came in a cherry yellow color but it was only offered in the regular sizing. This romper is 100% polyester and unlined but it’s not see through. It reminds me of the romper I missed last year at the regular LOFT stores (as seen on Christine of Petite Hues here in the polka dot print). Unfortunately, the polka dot print was only available in regular sizing much to my disappointment. 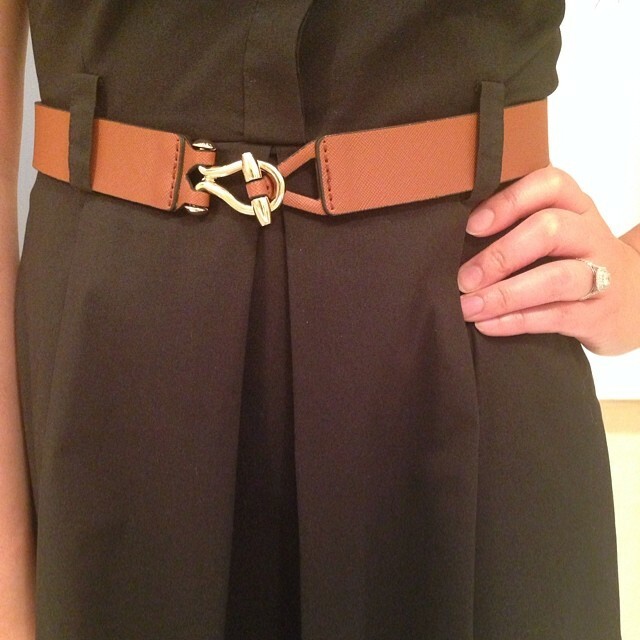 I happened upon this cognac belt at Banana Republic Factory by chance since it was our last stop. I love how it looks like saffiano leather, it’s made really well and looks more expensive than the $14 I paid for it. Note that it has a stretchy elastic band on the back so it’s very comfortable and not too tight. I tried these Jack Rogers sandals which were on sale at Saks OFF Fifth for $99. I also noticed a sign advertising an additional 30% off the lowest ticketed price which would have made them $70. I didn’t buy them this time around but I was really tempted to. They were really well made and looked cute on my feet but I wasn’t sure how versatile they would be. I also wasn’t familiar with this brand and wanted to do more research and price comparison. 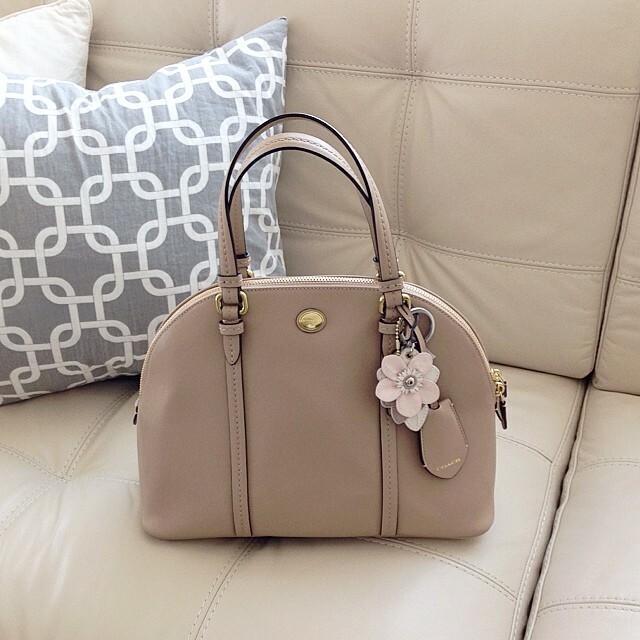 I’ve been on a Coach Factory kick recently and I meant to only browse in store but I fell in love with this bag at first sight and couldn’t leave without it. It reminds me of the LV Alma bag in epi leather. I felt bad about my impulse purchase and I really was not supposed to buy another bag so I listed a few items for sale to help clear out my closet. Thanks to the lovely ladies that helped take those items off my hands! I plan on listing more items in the near future so please follow me @shopwhatjesswore on Instagram. 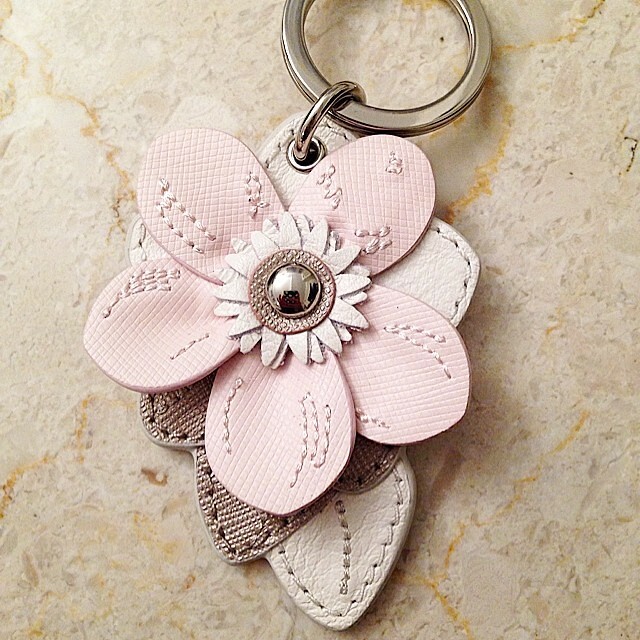 How cute is this flower key chain? I saw it during checkout and snagged two. One for me and one for my friend that wasn’t able to join us since she’s going through a very rough first trimester. 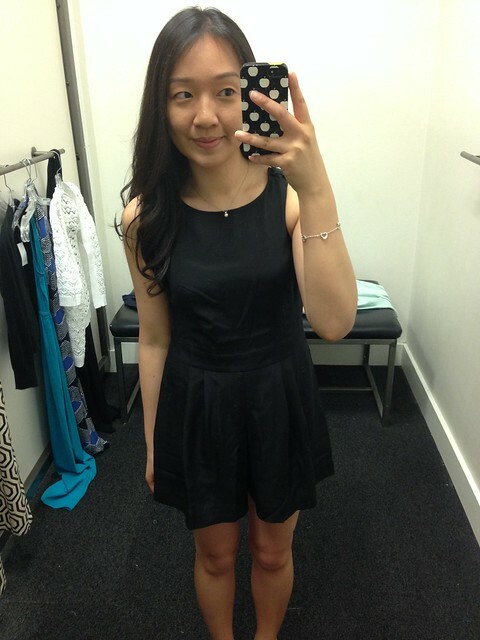 Hi Jess, I also ordered the floral maxi dress and the striped linen dress. Very pleased with the purchase. 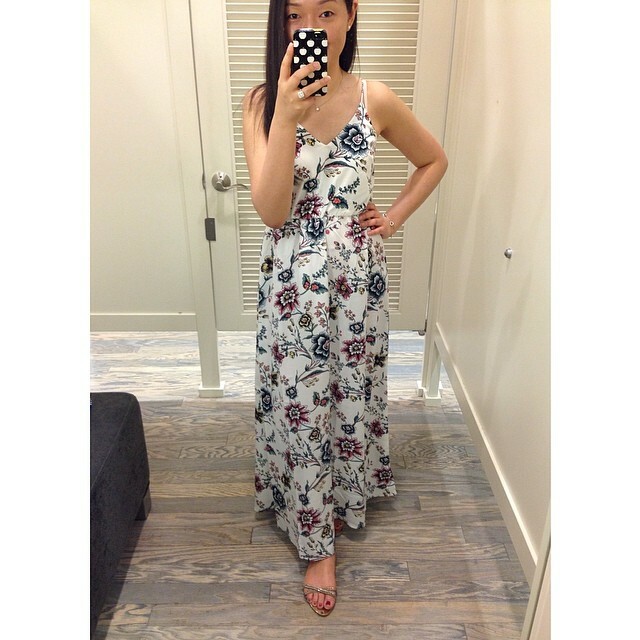 one thing i keep wondering lol, why didn't you buy the maxi in store when they have your size (00p)? but order online instead. I love shopping at LOFT (& AT) as much as you do.I'm also petite and most of my items ordered from their website and many returns have made, of course. Their sizing is not consistent and i'm range from 0P -2P and XXSP – XSP. I think we are similar in sizes and I find your reviews really help. I too read about the return warning from s/o who complained on their Facebook and was worried (recently I went crazy and ordered every week omg). I tried to find more information and read one also says that was a pilot program and they already stopped it. Although some stores still practiced it and some don't. One lady commented that she couldn't return to her regular store but was able to make returns at another without any problems. Anyway, it's good that they lifted the return ban for you. That's good to know that we're around the same size! 🙂 I rarely shop at AT because they tend to have a different fit and the quality isn't always that great for the higher prices they charge. I used to shop at LOFT way too much so while these last 3 months felt like a punishment of sorts at least it helped to curb my shopaholic ways. I admit to asking my mom to sign up for a LOFT card (or making returns using my fiance's ID). I heard and noticed they didn't ask for a license when she made a return on it but I'm relieved that I can return freely now without hassling others. I know I shouldn't get into my old habits again. I probably make a purchase every few weeks now when they do 40-50% off of what I like and it's forced me to go in stores to check something out first. That really helps to eliminate the amount I order/return because it was tiring making trips just to return what I shouldn't have ordered in the first place. Plus I have way too many clothes as it is. I see. 🙂 I've only asked her once. I ended up signing up for my own card because I decided it was about time I earned some rewards for all that I spend there. Thanks for checking out my instagram. You don't need an account to view it so that's a good thing. Anyone's account can be viewed online via http://instagram.com/%5Binsert_username%5D and as long as their account is public.